With the right words even the most mundane can be interesting. In this article we are going to walk you through a few simple steps that will help you get to the great description that your product deserves. 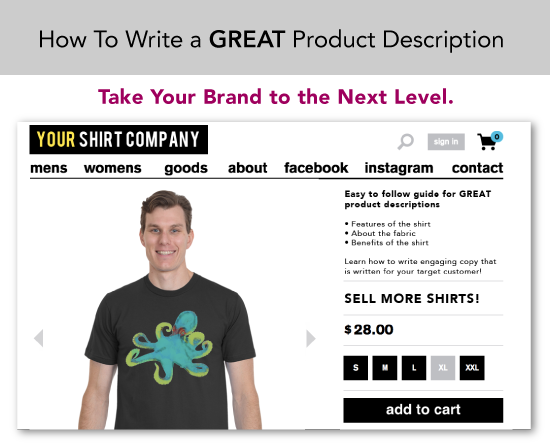 When writing your product description, your goal is convincing your target customers that your brand is exactly what they’re looking for and then telling them why. Are your customers hipster 20 somethings or maybe they are nerdy comic book enthusiast males aged 30-40? When narrowing down your target audience think about age groups, gender, marital status, hobbies and interests etc., e.g. females with children aged 20-30. Once you know your target audience you can tailor your verbiage to appeal to that audience. Any sizing tips or guides for your customer? e.g. Include sizing charts or infographics if you can. This can be in list form of dimensions and size or shown with a graphic like below. Start writing down your answers to the these questions and also anything else that comes to mind during your brainstorm. Your customer won’t see this, so don’t be afraid to write down everything that comes up, however crazy or silly. Brainstorming helps to get the creative juices flowing and makes writing more fun. Once you know who your target audience is and have planned your content, writing a first draft becomes much easier. Begin writing your description by translating the features of your product into benefits. A feature is a fact about your product, while a benefit is an explanation of what that feature does for your customer. A benefit can be phrased as a positive (e.g., durable fabric) or as a problem that’s avoided or reduced (e.g., colors won’t fade). Think about the target audience that you defined in the beginning. Keep your audience in mind as you write your description and set your tone. Your tone of voice shows who you are and how you deal with your clients. Here’s an example of a product description from Zappos. Notice how the description is clearly written for someone buying the slippers as a gift, presumably a girlfriend or wife. Also, pay attention to the lighthearted tone of the description. To define your tone of voice, consider what you are and what you’re not. For instance: We’re cheeky and fun, but we never use bad language. Or: We’re business-like, but not boring, and we don’t use gobbledygook phrases such as market-leading and world-class. If you were going to speak to your buyer persona in real life, which tone would you strike? That’s the voice you want to emulate in your writing. Review your list of features and benefits to ensure you haven’t missed anything. Check your engagement level. Is the copy focused on the customer or your company? Highly engaging copy uses the word you more often than your brand or product name and the words I, we, and us. Improve readability by replacing difficult words with simple words and by reducing average sentence length. Don’t worry about starting a sentence withand, because, or but. Even Apple copywriters start their sentences with conjunctions. Replace generic phrases with specific details, because specificity increases your credibility. Excellent customer service is a generic phrase that doesn’t sound credible. We’ll answer your inquiry within 24 hours is more specific and credible. Include numbers where possible, because they represent facts and stop wandering eyes. Before you move on to your last step, picture yourself talking to your buyer, and read your copy aloud. Do you stumble over any sentences? Does your copy engage your buyer? Does it persuade him/her to buy? Polish your copy until you can entice your buyer to purchase. Jot down 20 questions your buyers might have about this item. Now, comb through your item description and see if you’ve answered them all! If you haven’t, try to pop in those answers without overwhelming the buyer. Step away and bounce it off some people. Now that you have a written version of your description its a good time to step away from it and show it to a few people. Stepping back will give you a fresh perspective when you read it again and getting input from others is helpful to phrase descriptions so that they make sense to everyone that reads it. Try and show it to people that would most likely be candidates to buy your item. Got a tip? Let us know as a comment below!